Underactuation is a widely used and a relatively old concept in robotics. Basically, it expresses the property of a system to have an input vector of smaller dimension than the output vector. Practically, in robotics, it means having fewer actuators than degrees of freedom (DOF). Applying this concept to robotic grasping arises from a simple fact: it is desirable to be able to grasp objects using a simple control rather than having to command and coordinate several actions. The idea behind underactuation in grasping is to use an ingenious mechanical system that can adapt to the shape of the object automatically. This mechanical intelligence, embedded in the hand, is based on the principle of differential systems. The latter devices automatically distribute one input to several outputs, the ratio between the different outputs being determined by the design parameters and the output states themselves. The same philosophy of intelligent design is commonly found in mechanical linkages where the different link lengths and joint types are determined at the design stage in order to follow a particular trajectory. If this trajectory is entirely predetermined, then only one DOF suffices to follow it. Yet, if this trajectory is too complex, a multi-DOF mechanism capable of following any trajectory is often chosen. Similarly, in robotic grasping, anthropomorphic hands have been predominant for years in research laboratories while industrial needs were often satisfied by a few simple grippers. 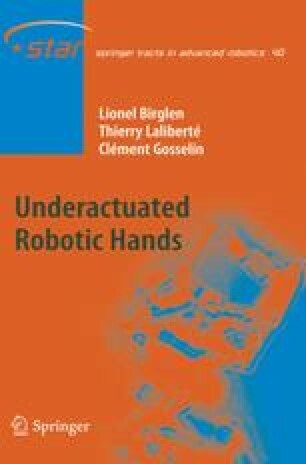 The postulate behind the use of underactuation in grasping can be stated as follows: if the task to be performed is grasping, it should be possible to accomplish this one action using one single actuator.